After watching the failure of the Global Rallycross racing season, Volkswagen has enthusiastically jumped aboard its replacement, the American Rallycross (ARX) series. It kicks off Friday in Silverstone, England. About a month ago, stories circulated that the Red Bull Global Rallycross (GRC) series had suddenly shut down, leaving a trail of unpaid bills and track managers fuming. For, example, the race series stuck the state of Michigan with a tab of $70,000 or so. The series also left the Thompson Speed Park in Connecticut with a tab of more than $10,000, though GRC paid a small part of the bill. Thompson’s manager said the GRC series cost him a lot more than the missing money as he lost days where they could have rented out the track for testing and other purposes. In sum, the series stuck facilities with more than $100,000 in bad debt. Indeed, for a time it looked like the series was down for the count as weeks went by with no information about what was happening. And now it looks as if a new rallycross series has come into the picture to take the place of the Red Bull GRC. Built on the mess left by the earlier sponsor, the new effort is exciting drivers, audience members and many who, despite their knowledge of what happened to the GRC series, still want a piece of the new action. The Red Bull GRC was good for Volkswagen as the automaker and the team it sponsored took the manufacturer’s trophy four times in the last four years. The GRC series also provided Scott Speed and Tanner Foust with a total of four driving championships, as well. Now, there is a newly minted series ready to take the place of the financially ailing GRC, the Americas Rallycross series. Volkswagen will return to the rallycross wars through the VW Andretti Rallycross team. 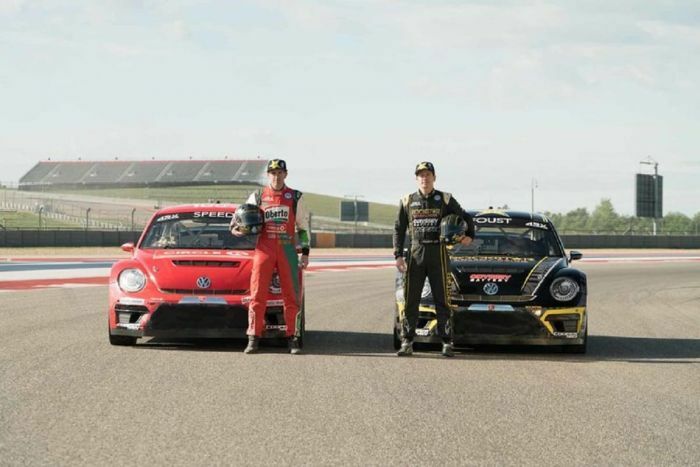 They will support the acclaimed and successful Beetle Supercars, driven by Speed and Foust, who hope to continue their successes in the new series. Calling it the Americas Rallycross seems somewhat euphemistic at this point as the U.S. season-opener is at Silverstone, England. The season opens Friday at Silverstone’s brand-new Rallycross circuit. The debut occurs during the Speedmachine Festival. The American series (ARX) is timed to coincide with the British round of the 2018 World Rallycross Championship (WRX). For Tanner Foust, the pilot of the No. 34 Rockstar Energy Drink Beetle is no stranger to the world stage at Silverstone. In 2011 and 12 he won races in the European Rallycross championship, the first American to do so. Speed and Foust will continue to campaign the Beetles they drove successfully last year. The vehicles were built by Volkswagen Motorsport. They have had their handling characteristics updated. A turbocharged 2.0-liter four, capable of 560 horsepower will remain the standard powerplant. The event on Friday will be live-streamed on CBSsports.com. Initial race will be live-streamed on CBS.